Today I’m guest-posting on Pinterest Told Me To and sharing my take on a preppy red, white & blue look. Click here to read all about it! Don’t forget you can vote for me once a day for me here in the Wallis Fashion blogger contest – I would so appreciate your support! Love that H&M blazer, I am in need of a white one!! Love this look, crisp and preppy yet unpredictably on trend! YAY! i love pinterest told me to! can't wait to check it out! What a great layered look! How do you do so many layers are not look bulky? I always feel so puffy when I do more than 2 layers. I love the clear colours of this casual chic look and already got my white blazer for this season! Thanks again Kimberly for your awesome guest post!!!!!! I know my readers are going to love you! This is such an All-American type look – I love it!! I love everything about this! SO Cute!!! 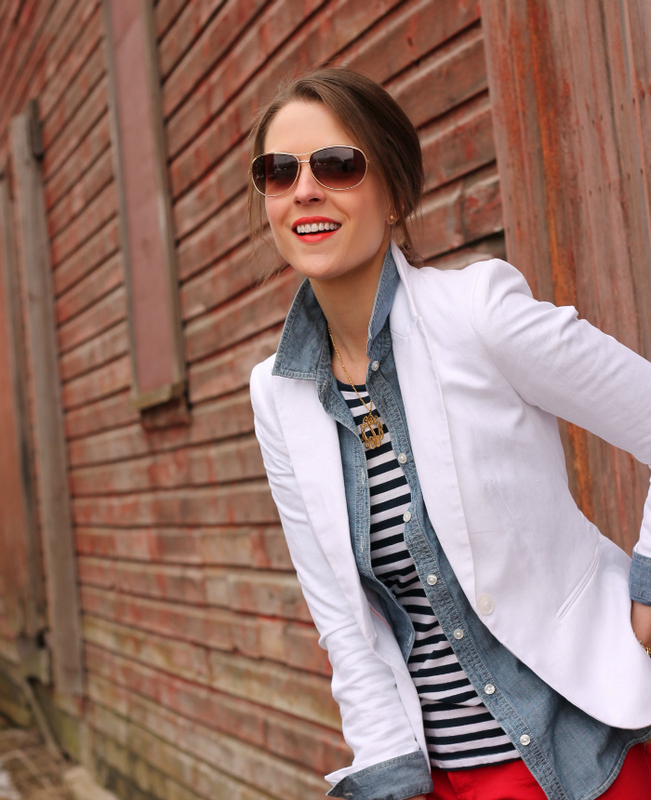 You know I love a good, crisp, white blazer & this layering is perfection! Loving all of the layering going on here! Love a nautical themed outfit!! Hi Kimberly – I just discovered you through one of my favorite bloggers, Sheaffer. We have an awful lot in common! You're gorgeous mama and I'm in love with your style! Your looks never disappoint! This is adorable I love you you layered everything so perfectly. This look is fabulous on you!! I love all these pieces. So excited to have yet another thing to pair my chambray shirt with! Love the stripes and red! I think this is one of my favorite outfits! I LOVE all of the layering happening in this look and your monogram necklace is just perfect! Saw your guest post on Pinterest Told Me To….LOVE this outfit!! love this outfit! that blazer is perfect. Love this outfit, specially those red jeans. You look very nice. 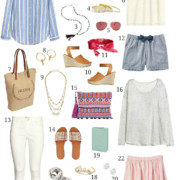 The perfect crisp preppy spring outfit. LOVE! Such a great look! Perfect layering! I came across your blog a few months ago…. and I have to say that you are one of my most FAVORITE style bloggers ever! Plus, the fact that you are a savvy shopper is even better! Your style is timeless and effortless! I love this look! Oh wow! We love this so much. I LOVE this outfit! Heading over to check out your guest post now.